Dr Nicholas Tate looks at the philosophies of 10 great thinkers from history and explains how their ideas put current education issues into a new perspective, while suggesting additional ones to be addressed. 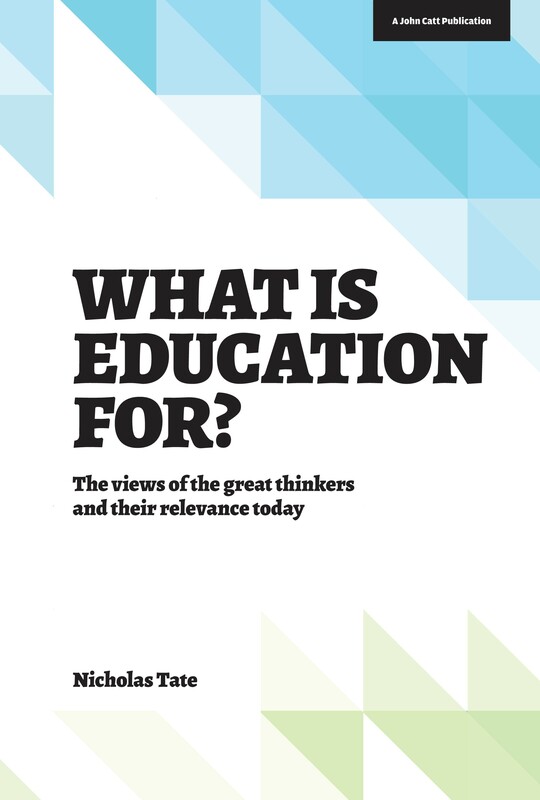 Dr Nicholas Tate looks at the philosophies of 10 great thinkers from history and explains how their ideas put current education issues into a new perspective, while suggesting additional ones to be addressed. The aim is to show how engaging with interesting past minds can both help put current issues in a new perspective and suggest additional ones to be addressed. Conclusion: What is education for? Dr Nicholas Tate has had a long and eminent career in many aspects of education, both in the United Kingdom and internationally. After state schools in the north of England he attended the universities of Oxford (Balliol College), Bristol (Department of Education), and Liverpool (Institute of Latin American Studies). He has a Master's degree and a Doctorate in history. Following a career as a teacher, teacher trainer and chief examiner in England and Scotland and with the Open University, he joined England's National Curriculum Council in 1989, becoming chief executive of the School Curriculum and Assessment Authority (SCAA) from 1994 to 1997 and then chief executive of the new Qualifications and Curriculum Authority (QCA) from 1997 to 2000, advising both Conservative and Labour secretaries of state for education. He subsequently became Headmaster of Winchester College (2000-2003), and director general of the International School of Geneva, the world's oldest and largest international school, from 2003 to 2011. From 2000 to 2005 he was also a member of the Haut Conseil de l'evaluation de l'ecole, an advisory body to the French minister of education. Among many other posts he has been governor of four English schools; trustee of The National Trust; chairman for ten years of the Oxford Conference in Education; and, as director general in Geneva, member of the G20 group of head teachers of leading schools from around the world. He gave the International Baccalaureate's Peterson Lecture in 2004 and has frequently spoken on educational issues at conferences both in the UK and other parts of the world. From 2009-15 he was a member of the IB board of governors and for most of this period chair of the board's education committee. He speaks and writes both French and Spanish, having spent nine years living in France and Switzerland and one year living in Spain. He was appointed CBE (Commander of the British Empire) in 2001.